The stores varied from very barn like, to modern functional towards the end... The store concept killed the company. How so? You don't think it was high prices of commodity equipment in a crowded market that killed it? Computers were a race to the bottom with e-machines being pushed at razor thin margins. Was the beginning of the dotcom era the right time for branded stores? Gateway decided to go crazy and opened up hundreds of stores in the US market - these things eat money. They did the same in Europe and Asia, but on a smaller scale. They abondoned their original business model. There were other factors of course, the Asian economy crashed while Gateway had spent millions expanding there, but within 24 months, Jezz Wietzen CEO (appointed by Ted Waitt while he took a back seat in '99), started pulling the foundations of the company apart until he was fired and Ted came back a couple of years later (2001) and tried to turn things around. Gateway never made up the ground it lost under Weitzen and Ted tried in vain, but it was too late, although a valiant effort. Edited by Zafinn Books, Thu Mar 28, 2019 4:22 AM. Exactly, it was a very odd decision - many belived that a corporate store in prime city location (they started these in Europe in 96, so you had a "showroom" in London, Dublin, Paris, Stockholm, Amsterdamn etc etc) was enough, a bit like today's Apple Stores, but on a much smaller more cost effective way. The core business model was mail order by free-phone, when GW2K opened its online store/website (1996) it was pulling in good numbers (and kept growing) as more people began switching from phone ordering to the new online model. The Dotcom "bubble" did not effect online sales, the world economy did slump in 2000/2002 and PC sales slowed, but Gateway kept spending money on stores anyway. 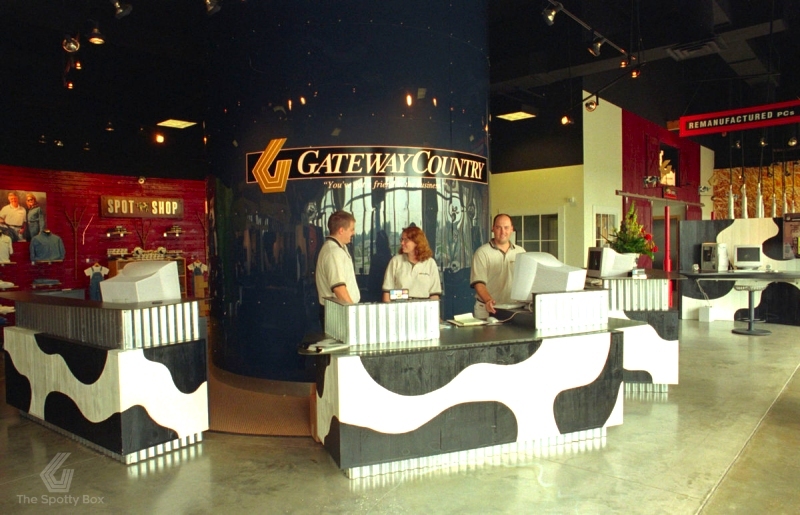 If Gateway had pushed the online side of its business and ploughed a fraction of the cost of the stores into its online tech, it could have been a different story. Edited by Zafinn Books, Thu Mar 28, 2019 4:21 AM. Fair enough. Retail is hard, and real estate over-expansion seems to have done in many big brands. Yay for the dot-bomb days. The Apple Store analogy is interesting. Apple stores as we have today didn't come along til much later, During this period, they would "showroom" at stores-within-stores at now-dead places like Sears, Circuit City, and CompUSA. Everything had high prices and dubious value back then. Of course, the teal cause for their demise is choosing a CEO named "Jezz." OKOK I will concede the "classicity" of Gateway ...I do t have to like them for them to be interestingly old. Jezz, what a typo! I meant "Jeff"... Doh! Yes, that's it! Thanks for weird memory! I've never seen that thing in real life, but I remember ogling those very same ads. Re "jezz," now that I have my old person glasses on, I see that I typed "the teal reason"
Obviously because that was a big color back then. Teal. To be fair, it's also hard for me to feel the same nostalgia for 90's PC's that I did for Atari computers because A.) they were all beige boxes that ran Windows and B.) didn't have the same uniqueness as earlier home computers ot even Macs. But that's not to say the PC games weren't fun because they were awesome... That's the part that I foundly remember along with the early years of the Internet and even emulating previous computers & consoles that we moved on from to still play those games. It's just that I can play those same games on my current PC using patches, GOG rebuys or something like DOSbox. That said, I really liked the design of the Gateway 486 computers with the curves... I knew someone who had one and was impressed with how different it was from the usual beige boxes at the time. Edited by MrMaddog, Sun Mar 31, 2019 2:16 PM. It's hard (or nearly impossible) to feel nostalgic about anything you didn't directly experience - and that means the thousands of clone PCs being made back then. And because they were establishing standards like ISA and VGA and SOUNDBLASTER, well, that made them even more alike than not. So no differentiating qualities there. Nearly everyone I spoke with considers their first PC highly nostalgic. But that is one single specific individual PC. My Gateway 486 isn't a nostalgic platform that much to me. And there isn't anything about mail order to get excited over either. It's. Just. Mail. Order. But I found great interest and had tons of good times learning about the various various subsystems are, as I was into learning about the emerging technologies and how ,uch more sophisticated and capable they were compared to the 8-bit and 16-bit machines I was using previously. It was (is) highly nostalgic to flip through my catalogs and sales materials and the brochures I collected from the then supermarket-like computer stores. BITD we tended to shy away from advertisements. Today they are great fun to read and re-read!